By Caixin Staff Reporter Pu Jun and Intern Reporter Huang Kaiqian. This article was first published by Caixin. China wants to reap the benefits of a shale gas revolution similar to the one in the United States, but there are many obstacles to this happening, experts say. In the first half of 2013, fifty-six shale gas wells were in the exploratory phase in the country, but only twenty-four were producing gas. Only six wells—all dug by either China Petrochemical Corp. (Sinopec Group) or China National Petroleum Corp. (CNPC)—had daily output capacity of 10,000 cubic meters or more. And all the shale gas blocks sold in the most recent round of auctioning were in the early phases of prospecting, meaning they had not produced a drop. The latest five-year plan set for the shale gas industry was laid out in 2011. It set a production goal of 6.5 billion cubic meters of shale gas by 2015, but many industry insiders say this will be hard to achieve. 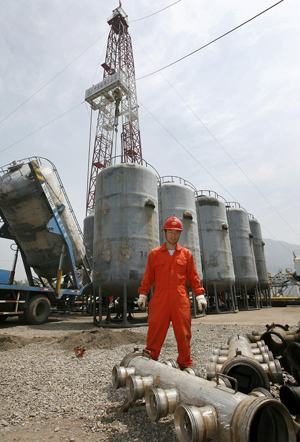 A man works at an exploration site in the Longgang gas field in Lishan, Sichuan province. “As we are facing enormous cost pressures and other problems, the speed of exploration has been slower than anticipated,” Zhang Dawei, director of the Mineral Resources and Reserves Evaluation Center of the Ministry of Land Resources (MLR), said at a symposium in June. Chen Weidong, lead researcher at China National Offshore Oil Corp.’s (CNOOC) Energy Economics Institute, said the average annual production of a shale gas well in the United States is about 5 million cubic meters, and China would need 1,300 operating wells to reach its goal. “At present, it costs us about 80 to 100 million yuan to develop a single well,” he said. “So even if we were successful in developing the number of wells required, we’d be looking at 130 billion yuan [in upfront investment]. And there is no sign the wells needed to achieve these lofty goals are in the works. The director of the Shale Gas Department of the MLR Geological Survey Department, Bao Shujing, said at a conference in June that auctions planned for later this year would see ten or fewer blocks go under the hammer, not the previously anticipated twenty-three. The auctions would also be held later than anticipated, said Bao, at the end of the year at the earliest. The life spans and production cycles of shale gas developments are longer than those for conventional natural gas, at between thirty and fifty years. Stable production from an average single shale gas well, however, is only between 20,000 and 200,000 cubic meters per day, a far cry from the several million cubic meters yielded by conventional natural gas wells every day. Despite this, shale gas wells cost much more to develop. The first shale gas well was dug in 1821, but high-scale commercial development did not begin until 2005. In 2011, shale gas daily production in the United States hit 182 billion cubic meters, 28 percent of the country's total natural gas production. The world is paying close attention to North America’s pursuit of energy independence. Low energy prices have helped to bail out U.S. industries such as chemical engineering. The U.S. shale gas story is particularly appealing to China, a nation whose rapidly growing energy demands outstrip it supplies. A 2011 report by the U.S. Energy Information Agency estimated total world shale gas reserves that are exploitable using today's technology at 189 trillion cubic meters. Of that, 36.1 trillion cubic meters are in China, making it the world leader in shale gas reserves. In 2011, the MLR launched an investigation into potential shale gas reserves. The results indicated China had 25 trillion cubic meters of developable reserves, slightly more than the United States’ 24 trillion. However, the lead geologist for state-owned chemical producer China Sinochem Corp., Li Pilong, said “the scientific nature of the data behind developable shale gas reserves is doubtful.” Some experts hold there are really only 10 to 12 trillion cubic meters of developable shale gas reserves in the country. The MLR has put shale gas blocks up for auction twice, in 2011 and 2012. In 2009, a shale gas block in northeastern Yunnan Province was the first to be approved by the MLR for exploration. Most shale gas exploration in the country is centered on the Sichuan Basin, the Ordos Basin, the Liao River depression and other areas. The director of the New Energy Bureau of PetroChina’s Exploration & Production Co., Lei Huayu, said his company is planning to dig 122 horizontal wells between 2013 and 2015, of which 113 will start to produce gas by 2015. The company wants commercial shale gas production of 1.5 billion cubic meters in 2015, the final year of the latest five-year plan. Four kinds of companies are exploring shale gas opportunities in China: traditional oil and gas companies like CNPC, Sinopec, CNOOC, and Yanchang Petroleum; unconventional companies like China United Coalbed Methane Co. and Henan Coalbed Gas Co.; power companies like China Huadian Corp.; and local energy and urban construction investment platforms. In the long term, the lion’s share of oil and gas exploration in the country has been dominated by the Big Three state-owned oil companies: CNPC, Sinopec, and CNOOC. Some 77 percent of the area for usable shale gas blocks and 80 percent of the resource potential are controlled by these companies. The MLR has attempted to diversify the industry by auctioning off remaining shale gas resources to other companies. But CNOOC’s Chen said the best blocks have already been taken over by CNPC and Sinopec, and major strikes are unlikely outside traditional oil and gas production blocks. Companies of all stripes are running into technology problems. The shale gas exploration experience in the United States demonstrates that large-scale well-digging, horizontal drilling, and multistage fracturing technology, or fracking, have been the keys to breakthroughs. China depends on vertical drilling technology, which matured during the exploration and development of conventional natural gas deposits. Bao said that since shale deposits are dense, and because deposits are less abundant than conventional natural gas deposits, the use of horizontal multistage fracturing is the only way to penetrate small gaps and extract oil and gas from rock. The key to breaking down dense shale deposits is this multistage fracking. In the United States, horizontal wells and fracking are used in 85 percent of shale gas deposits. In China, however, successful, high-output use of these approaches has been limited to a few deposits in Sichuan. All key technology and equipment for the procedures must be imported. Last year, daily production at the Yang 201-H2 shale gas well in Sichuan, developed by CNPC and Royal Dutch Shell, hit 430,000 cubic meters. Another well, CNPC’s Ning 201-H1 well, also in Sichuan, produced over 120,000 cubic meters per day. A report by the U.S.-based Association of Petroleum Engineers said that in the United States horizontal wells generally had initial daily output of between 60,000 and 300,000 cubic meters, but production falls off 65 to 80 percent after the first year, 35 to 45 percent after the second year, 20 to 30 percent after the third year, and another 5 percent every subsequent year over a lifespan of stable production of 25 to 30 years. An expert at the CNPC Consulting Center said that unlike the United States, China faces obstacles in geological conditions and technological constraints, so the efficiency of its shale gas industry is lower on the whole. State-controlled prices are another challenge for shale gas developers. At present, commercial shale gas will be sold at nearly the same price as conventional natural gas. Many experts at CNPC say this means the company will lose 0.6 yuan per cubic meter of shale gas extracted, so even though it occupies the largest amount of shale gas blocks, CNPC and Sinopec are very cautious about the industry. “Whether in terms of technological preparation or natural gas prices, insiders in the Big Three state oil firms think the time is still not right for shale gas development, that right now we’re in a period of technological preparation and awaiting economic feasibility,” Chen said. In order to spur enthusiasm among companies outside the Big Three, in November, the Ministry of Finance and the National Energy Administration announced a subsidy to spur the development of the sector. Between 2013 and 2015, the central government will begin paying developing companies 0.4 yuan per cubic meter of shale gas extracted. However, the policy stipulates that subsidies will be paid only for shale gas that has been extracted, not for potential reserves. At present, however, many of the shale gas blocks involved in the latest round of auctions are still in the early stages of exploration. “The investments that go into early exploration are massive, which makes it hard for companies to survive financially until the day they finally begin extracting,” Chen said. This means that only state-owned enterprises (SOEs) with abundant capital backing, such as electricity firms like Huadian Group, are optimistic about shale gas development. In 2010, natural gas accounted for only 4.4 percent of China’s primary energy consumption, significantly lower than the world average of 23.8 percent. The latest five-year plan wants this to increase to 7.5 percent by 2015. Despite the appeal of shale gas production, the country will still need to rely on conventional natural gas to meet this ambitious goal. The vice chairman of the advisory committee of Sinopec Exploration & Development Company’s Research Institute, Zhang Kang, said the country had to focus on increasing reserves and production of conventional oil and gas. He said development of nonconventional resources should be done first in older oil and gas areas and areas with relatively developed economies. The China director of management consulting firm Accenture, Yang Wei, said that the reason that shale gas development in the United States has been profitable was because an active industry chain has formed, which spurred operators at every stage. Unlike in China, small and mid-sized companies—not traditional oil and gas powers—account for over 80 percent of U.S. shale gas production. In 2005, twenty-three companies were developing shale gas projects in the United States. Two years later this number jumped to sixty-four. In the face of pressure from high costs, small and medium-sized companies are quick to upgrade technology. This has been the primary driver of rapid technological advancement in U.S. shale gas extraction. The director of the Hope Investment Management Co., Fang Fenglei, said China’s government-led initiative is inefficient. Fang said conditions in the country do not allow for private companies to spur development through innovation. On the one hand, there are too few private companies, and their capacity for investment and risk-taking is too small. On the other, capital markets are uncooperative, and there are obstacles to fundraising at every level.